This superbly restored Elizabethan manor house is ideally located near London Stansted Airports perimeter, offering free parking. From the moment you check-in,you will receive the warmest of welcomes from friendly staff,whom throughout your stay will be fully accommodating to any specific needs you may have,allowing you to simply relax,unwind and enjoy your stay. Wi-Fi is available in all public areas and rooms. The hotel also has the benefit of an on-site car parking,enabling you to leave your car safe and secure before jetting off on a business trip or a leisure vacation. The Whitehall Restaurant offers a great choice of cuisine, while a bar offers snacks and drinks perfect for pre-dinner drinks or before retiring to your room. 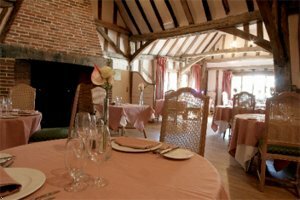 The Whitehall hotels Restaurant is famous for serving some of the finest dishes in the country,providing a fantastic selection of freshly prepared cuisine. Meals are served in the magnificent surroundings of the 15th Century dining hall,where you are sure to enjoy a memorable dining experience. Classic Sunday lunch of Roast Beef and all the trimmings - 3 courses is also served. Barn Suite Length - 18 Meters Width - 9 Meters Height - 15 Meters Maximum Theater Style Capacity - 100 Maximum Classroom Style Capacity - 40 Maximum U Shaped Style Capacity - 35 Maximum Boardroom Style Capacity - 48 Maximum Banquet Style Capacity - 100 Meeting rooms have windows for natural daylight that can be effectively blacked out. Description Meeting room with natural daylight. Butler Suite Length - 12 Meters Width - 6 Meters Height - 5 Meters Maximum Theater Style Capacity - 45 Maximum U Shaped Style Capacity - 18 Maximum Boardroom Style Capacity - 22 Meeting rooms have windows for natural daylight that can be effectively blacked out. Description Meeting room with natural daylight. Club Room Length - 5 Meters Width - 4 Meters Height - 5 Meters Maximum Theater Style Capacity - 10 Maximum Boardroom Style Capacity - 8 Meeting rooms have windows for natural daylight that can be effectively blacked out. Description Meeting room with natural daylight. Audley Suite Meeting rooms do not have windows for natural daylight. Description Meeting room with natural daylight.